The humble computer mouse was invented at least three times! Those who have been using computers for a long time might remember the balls inside mice. These tended to clog up with dust over prolonged use. Before the advent of optical and laser mice, this ball was what enabled people to have rich interactions with graphical user interfaces. Within the mouse, were rollers that monitored the motion of the ball, which was translated to the movement on screen. The very first mice, were actually built for analogue computers – and not digital mouse. An easy to use input device was required for RADAR and SONAR systems in warships, which lead to the invention of “tracking balls”. Think of them as inverted, exposed mice, where the user directly manipulates the ball, instead of rolling it along a surface. The first mouse was developed for an analogue computer of the UK’s Royal Navy. It was soon after the end of the second world war, and Professor Ralph Benjamin was working on the Comprehensive Display System, a system to calculate the trajectories of planes. The cursor on the system was controlled by a joystick. It was this version of the system that went into production. However, a single version of the system had a trackball for manipulating the cursors. Within a metal casing, was a metal ball, which was in contact with two rubber balls. Each of the rubber balls were for providing directional input. The metal ball itself was the only exposed part, which was directly manipulated by the user. The user cupped their hands over the metal ball, very similar to the way we use mice today. The “ball tracker” was patented in 1946, but the British Admiralty kept the invention a secret. The versions of the system actually installed in ships had a joystick instead of the ball tracker. The Navy was not interested in commercially exploiting the invention. Because of its status as a military secret, Benjamin did not receive widespread credit for the invention, and as such is not widely recognised as the inventor of the computer mouse. In 1949, The Royal Canadian Navy started working on its own tracking system for warships. The Digital Automated Tracking and Resolving (DATAR) system in collaboration with Ferranti Canada. Tom Cranston, Fred Longstaff and Kenyon Taylor, engineers at Ferranti Canada came up with their own version of the trackball. 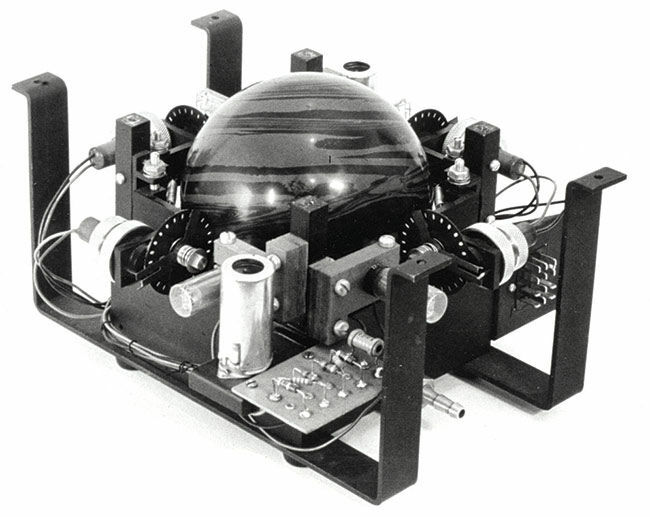 The device used four wheels arranged around a ball, which could be directly manipulated to move a cursor on the screen. Because of the extreme budget constraints the engineers could not even make a trackball from scratch, and ingeniously used an off the shelf bowling ball. Instead of two rubber balls in the UK Navy’s version, the Canadian Navy’s version of the trackball used metal wheels. The trackball was installed in the front of the command console. The input device for the DATAR system was also kept a military secret. On 9 December, 1968, Douglas Engelbart and a group of researchers demonstrated the capabilities of the oN-Line System or NLS. There were around 1,000 technology professionals in attendance at the Fall Joint Computer Conference in San Francisco. The demonstration showed hypertext, live collaboration, video conferencing – and the computer mouse. A cursor was used to manipulate the text in a word document. The ghosting cursor left behind a short trail as it travelled across the screen. The demonstration would later be called “the mother of all demos”. 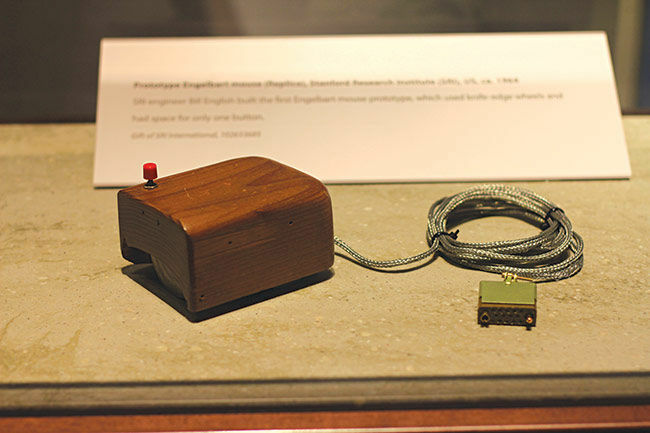 It is because of this demonstration, that Engelbart is widely credited as being the inventor of the computer mouse. The prototype of the mouse was realised by an engineer called Bill English. English based the design of the prototype on sketches by Engelbart. The body of the mouse was made out of wood. Below it were two wheels, with sharp edges. The wheels were mounted perpendicular to each other. Movement in the wheels showed the changes in the x and y axis. The mouse had a single button. The invention was patented under the boring name of “X-Y Position Indicator for a Display System”. A modified version of this mouse, with a “transport sphere” within, instead of the wheels, was later built by Xerox. The process from ideation to demonstration took almost a decade. In 1961 Engelbert thought of the device. It was built by English in 1964. In 1966, English and Engelbart approached NASA to conduct a study to determine the best input device for GUIs. NASA agreed to fund the study, and the mouse performed extremely well in terms of speed and accuracy. As the result of these tests, the wire for the mouse was switched to the front instead of the back, to prevent people’s arms from getting entangled in the wire. The story of how the mouse came to be almost mandatory for desktop computers, goes back to a tour that Xerox gave Steve Jobs in 1979. The Xerox owned Palo Alto Research Center (PARC) facility had on its campus, a version of the computer mouse designed by Douglas Engelbart. Steve Jobs was allowed to peek into technologies being developed by Xerox, in exchange for a hundred thousand shares in Apple, ahead of its highly anticipated 1980 IPO. It is said that “Steve Jobs” stole the idea of a GUI and a mouse during this tour. The Xerox made Alto computer had a mouse, which cost about three hundred dollars to build, but was popular among the users. Steve Jobs made another engineer, Dean Hovey, design a mouse that cost less than fifteen dollars to build, and lasted for a few years. The Apple Lisa computer was accompanied by a mouse as a standard input device, which was very well received. Xerox would move out of the desktop computer business soon after. Jobs was so excited after seeing the Alto mouse, that he hopped around the room and called it “revolutionary”. In the 1980s, there was a rush to develop mice that did away with the trackball or wheels entirely. One of the early input devices actually used audio instead of optics to measure the motion of the mouse. A “visual input display device” patent awarded to Ian Page in 1981, used a pair of piezoelectric audio pickups to measure the movement of the mouse based on tiny acoustic pulses. Steven Kirsch and engineers at the Xerox corporation both came up with optical devices. These early optical mice required a particular kind of pattern on the surface along which the mouse had to be moved. Satish Dhawan also invented an optical mouse, which involved a “mouse tablet” as the surface, with the mouse on top of it. The design allowed users to place engineering drawings between the mouse and the tablet surface. The patent was granted in 1986. Other innovative designs from this period includes external sensors to track the movement of the mouse, and a mouse that hovered over the surface of the table, lick a puck in a game of air hockey. The first commercially available optical mouse was the IntelliMouse Explorer introduced in 1999. There was no requirement for the substrate to have a particular pattern. This got rid of the requirement for a trackball, or a mousepad. The optical sensor was supported by an integrated digital signal processor. The mouse also had two customisable function buttons on the side. At the time of the introduction, Microsoft called it the “most radical computer mouse technology and design advancement in the 30-year life of the mouse”.